During the days of the Roman occupation of Israel, there was a rabbi debating with a Roman soldier over whose people were superior. The soldier pointed out the great temples, works of art and architecture of the Romans and also their technological advances as evidence they were the greater society. The rabbi in turn insisted that the Jews were better because of their moral basis. He felt the fact that they loved their enemies as well as their neighbors made them the superior people. The soldier asked the rabbi if he considered himself to be the soldier’s enemy. When the rabbi replied in the affirmative, the soldier then asked the rabbi if he’d give him his land. The rabbi said yes, even though the soldier was his enemy, he’d give him his land. Next the soldier asked the rabbi if he’d give him his money. Again the rabbi replied yes, he would give him his money. Finally the soldier asked the rabbi if he’d give him his coat. Much to the soldier's surprise, this time the rabbi said, "No." 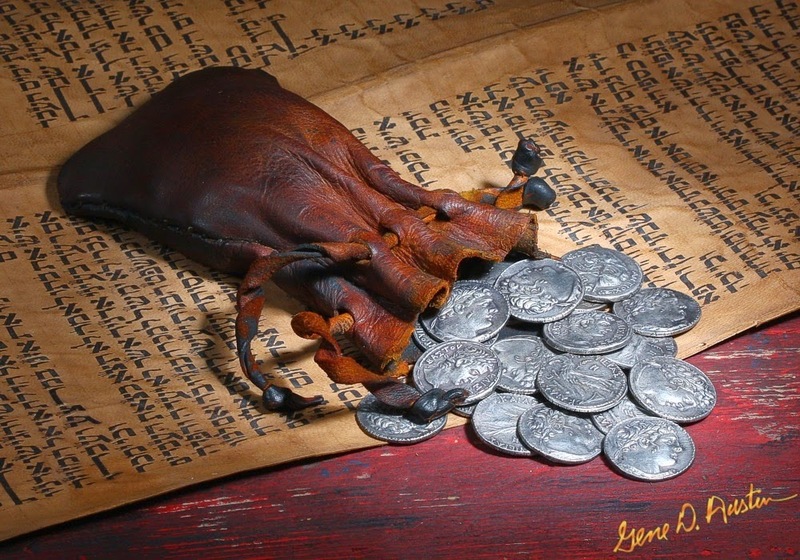 We read this passage in church a few weeks ago, and the pastor explained that thrity pieces of silver was not much money back then; it was the price of a slave. Judas sold out Jesus for a paltry sum. When the pastor asked the congregation if we would deny Jesus for a million dollars, I thought of the story at the beginning of this post. It’s easy for me to say I wouldn't deny Jesus for a million dollars because the odds are I'll never find myself in that situation. The sad truth is, we don't need a million dollars (or even thirty pieces of silver for that matter) to deny Jesus because we often do it for free. - heard someone use His name as a profanity yet didn't come to His defense? - felt Him prompting you to say or do something but ignored His voice? - failed to come to the defense of another believer? - acted like you didn't know Him? - saw or learned of someone in need but did not act? If we're critical of Judas, this means we also must be critical of ourselves. I'm sure Judas could justify his actions in his own mind just like we can. Perhaps he was one of the people who expected the Messiah to bring military victory and thought by putting Jesus in this situation it would force Him to act. Who wouldn't want someone who can miraculously feed multitudes and raise the dead heading up their army? I have to admit there have been many times I wanted God to act in accordance with my agenda. Thankfully, God's grace and my repentance make me far more like Peter than like Judas. Even after Peter denied Him three times, Jesus gave him the opportunity to affirm Him three times. (John 21:15-17) In the same way, Jesus allows us to return to Him even after we have willfully denied Him. How will you affirm Him today? Jesus, I can't begin to fathom the price You paid for my salvation, but I'm so thankful that You did. I'm grateful that You are a God far beyond my comprehension, for You wouldn't be much of a god if You were someone who fit my understanding. In Your grace, You always accept me back with open arms regardless of how many times I fall or wander (or run) away. Please continue to remind me of this truth in the times I fall short. *This story came from the teaching of Ray Vander Laan. Such a timely reminder. Thank you. Coming to you from the #TellMeATrueStory blog party. Lisa, Soooo much truth in these words. Thank you for posting! Stopping by from Unite link-up. Have a blessed week. WOW what a story! No not for a million dollars even! Thank you for sharing with us here at "Tell Me a Story." Lisa, this is a good word. I am leading an online Bible study for Easter right now, and we discussed this same topic last week. All of us agreed that we may not be Judas, but we betray Jesus by being selfish all the time. How will you affirm him today? Such a good question to ponder this morning. Thanks, Lisa! Very sobering to think about, Lisa. Visited you from Quitting Thurs. this morning. May you have a blessed Easter! Even Peter denied knowing Jesus. But he didn't hand him over to his enemies for cash. And he didn't devalue Him. Somewhere in here there's a distinction between motives/heart attitudes and weakness vs. malice. It's definitely a good thing to examine ourselves! But we also have to be careful not to fall into condemnation because we've ALL done things to let Him down. He has been my big time reminder. If anything is going around and about me that is NOT serving the Lord appropriately, not honoring Him, displaying ungodly attitudes, my heart breaks. I try to serve Him intensely to turn people to Him. Too many Judah's are living in our world. You shared well. Thank you.